At almost the same moment I began creating this post (and wondering WTH I’m doing up at this hour), the Moon became full. This occured only moments after it transitioned from Pisces to Aries. This Full Moon occurs only hours after the autumnal equinox (a term I used yesterday in my school-wide writing prompt and which sent most young writers scrambling for a reference of some kind). My previous post explored the Sun’s movement into Libra from a ‘Tarot perspective’. My favourite astrologer Kelly Surtees stated that the Moon moving into Aries was a prime time to fight for fairness for the underdog. This seems also to apply when we look at this through our Tarot lens. 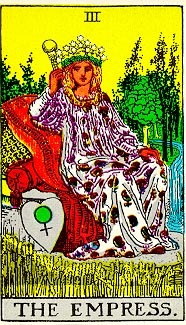 Very few cards better represent the underdog then our Priestess, the Tarot card associated with the Moon. Champion of feminine strength and wisdom, intuitive healer, mysterious master of the dark, her worth is often unjustly underrated by patriarchal structure. She frequently lives in the shadows. With her full Moon in Aries, she dons the garments of the emperor, which the Sun wore just six months ago. If the Sun represents our ‘best-self’, the Moon best represents our shadow self, the part of us Jung would associate with our instincts and our perceived flaws. When cloaked in the Emperor’s robes, the Sun in Aries allowed us to focus on our ability to lead, increased our confidence and our level of assertiveness. Our Priestess, when the Moon is in Aries, benefits from this imperial influence. This is indeed a time for us to stand up and be counted in whatever area of our life we feel disadvantaged. It is a time to shine the bright light of the Full Moon onto our shadow and celebrate our shortcomings. What will you do to celebrate your imperfections? How will you recognize you’re ‘perfectly you’ just the way you are?